The statistic shows a ranking of football/soccer teams according to their value as calculated by Forbes. In 2018, Forbes ranked Manchester United as the most valuable soccer/football team in the world, with a team value of around 4.12 billion U.S. dollars. Soccer, or football, is probably the most popular sport in Europe. 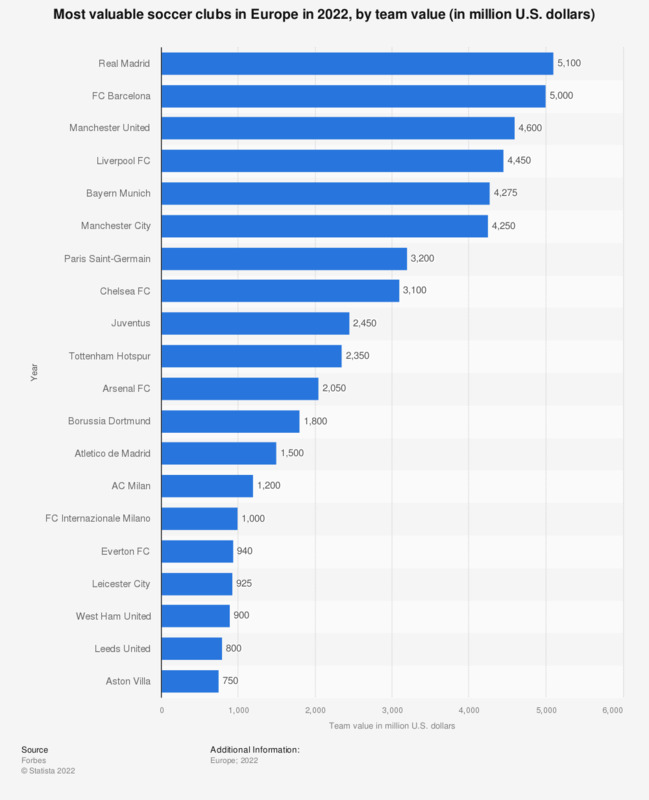 Professional level European leagues are the most competitive in the world, with the European soccer market being the largest with around 20 billion U.S. dollars in estimated annual revenue. Around 50 percent of that revenue is attributable to the so-called ‘Big-Five’ leagues : Barclays Premier League (UK), 1. Bundesliga (Germany), Primera Division Liga BBVA (Spain), Serie A (Italy) and Ligue 1 (France). Today, several clubs are valued at more than one billion U.S. dollars by Forbes, all of which are members of one of the top-5 leagues in Europe. Team value is based on current stadium deal (unless new stadium is pending, without deduction for debt (other than stadium debt).